Forty-five years after it revolutionised abortion law in America, the landmark 1973 US Supreme Court case Roe v. Wade is once again at a crossroads. In Reversing Roe, filmmakers Ricki Stern and Annie Sundberg, present a deeply unsettling look at the state of abortion and women’s rights in America. Drawing from a wealth of historical footage, the film charts the period leading up to the Roe decision - and documents the opposition that has followed ever since. Stern and Sundberg’s documentary is both fascinating and disturbing - exploring how abortion has become such a divisive issue in America and revealing just how this issue became politicised. Both sides of the debate are represented - the film features interviews with Colleen McNicholas and Curtis Boyd; feminist icon Gloria Steinem; Operation Rescue president Troy Newman; and National Right to Life president Carol Tobias. While it gives pro-lifers a voice, Reversing Roe feels very much like a pro-choice film. Unsurprisingly, this has caused controversy since the movie’s release with pro-life campaigners criticising the documentary for portraying them as a group of predominantly male, violent, religious extremists. It is true that many of the featured pro-lifers are extreme in their views. It would, perhaps, have been useful to have heard from some more moderate pro-life female representatives (who, according to the film’s critics, were interviewed for the documentary but then not included). However, despite the protestations of the pro-lifers, reversing Roe v. Wade (and the relentless chipping away of women’s rights in this area) feels like a significant backward step - an extremely dangerous move. The documentary tells the devastating stories of women who, pre-1973, sought ‘black market’ abortions - with often tragic results. The fact is that banning abortion does not stop abortions. Reversing Roe did leave me with some questions. For example, why was ‘Jane Roe’ (real name Norma McCorvey) absent from the narrative? In addition, how many of the approximately 1.3% of late-term abortions are conducted for non-medical reasons (ie. in circumstances when the mother is not at risk and the unborn child is healthy)? This is not a criticism of Reversing Roe. The film does not set out to be the last word on the abortion debate. I sense that Ricki Stern and Annie Sundberg would be delighted if viewers of their documentary were inspired to find out more about the issues involved (see Random Observations below). Awareness and education are, after all, critical. In addition, the outright ban of abortion ignores the complexities of this issue. Of course, late term abortions sound horrific on paper. However, you only have to hear the moving testimony in Reversing Roe to understand the devastating weight of such a decision. These women are not just selfishly changing their minds. They are often facing the worst situation imaginable. The only thing worse than having to make this choice, is for parents to have no choice at all. The (at best shockingly underhand, at worst horrifically violent) removal of reproductive choice and the vote grabbing politicization of abortion in America is an extremely disturbing trend - one that has been apparent for many, many years. Sadly, this trend tells us more about the divisive nature of politics and religion than it does about women’s rights, science and medicine. 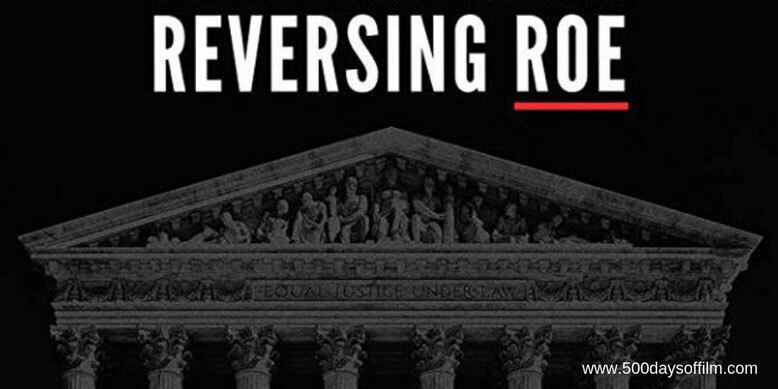 After watching Reversing Roe, I looked into the issues that had troubled me… none of the information I found weakened the documentary’s position. Have you seen Reversing Roe? If you have, what did you think of this documentary? Let me know in the comments section below or via Twitter. You can find me @500DaysOfFilm.